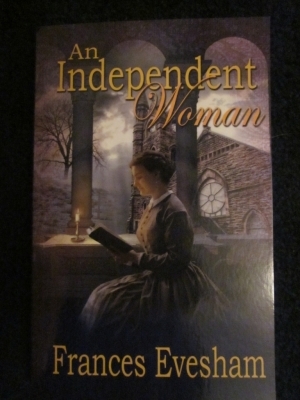 Not long ago, I read An Independent Woman, a wonderful, atmospheric Victorian mystery by Frances Evesham. Today I'm delighted to welcome Frances to my blog so she can tell us about her writing as well as a few other things. Before we get onto your writing history, I've got to ask about your reading history. Which books/authors/genres have given you the most pleasure? And which have spilt over into your writing? Thank you very much, Sue, for inviting me to your blog. Like you, I'm an avid reader. I spent my childhood reading Enid Blyton, The Borrowers, The Hobbit and books about horses. I wonder of any of your readers are old enough to remember Jill's Gymkhana by Ruby Ferguson? As a teenager, I began to read Mary Stewart, Victoria Holt and Agatha Christie. To this day, I love Christie's work. I remember walking along reading And Then There Were None, under a different title, on a family holiday because I just could not put it down. Was there ever such a clever twist as in The Murder of Roger Ackroyd? Then there is the divine Jane Austen. I read Pride and Prejudice when I was fifteen and hated it, but soon became addicted to her other books. Persuasion is my favourite. It is a wonderful, truly romantic story of love rekindled. I still find P and P difficult. I cannot quite forgive Mr Darcy's rudeness to people he considers inferior. Shyness, reticence and intelliegence are insifficient excuse! It's great that there are so many books being published or self-published at the moment. I have loved all of the late, very much lamented PD James and many of Ruth Rendell's books, especially her early works under the pseudonym Barbara Vine. I see from my Kindle that I've recently read and enjoyed Gillian Flynn, Philippa Gregory, Sarah Waters and Penny Vincenzi, and my friend Romy Gemmell currently writes lovely historical romances. Every single book I've read has had some effect on my writing, whether by inspiring me to write better or to make a note to avoid something I disliked. I know from various tweeted conversations that you were a reader of Voctoria Holt. I loved her books too, so I've got to ask whether her books influenced your decision to write a Victorian story? The attraction to me of the Victoria Holt novels is in the atmosphere she builds and the sense of danger that envelops her heroines. Her writing makes shivers run down my spine. She writes about the confines of the period, which means her heroines can so easily run foul of convention. That may be one reason for choosing Victorian times. It is so much harder for young women to misbehave interestingly these days. Have you written other kinds of fiction or were you a novelist from the start? I began by writing non-fiction. I was a speech therapist for many years and have written several short books aimed at enabling parents and early years professionals to understand how children learn to talk. I have, in my bottom drawer, one or two children's stories that may see the light of day in the future, but other than those, I'm most interested in full length adult novels. I love to become enthralled in the world of the story, whether reading or writing. I'm often disappointed at the end of a short story, because I want to know what happens next. I mix the two. I start with a careful plot, written on scraps of paper pinned to a cork board or in a spread sheet. I think it's a legacy from several years spent as a project manager, and I need to know where the story is going. However, once I'm writing, the characters grow and suddenly say or do something I wasn't expecting that alters the route they take to the ending. Anyone who has visited your website or Twitter page will know of your great interest in all things Victorian. The Victorians were a much-maligned bunch of people. They have an unfortunate image of prudish starchiness under a miserable, widowed Queen. Much of this stems from the stilted photographs we see, where the subject was forced to pose for up to 30 seconds. Photgraphy was in its infancy, and expensive, so now wonder people wore their best clothes and kept still, but there are other photographs of people making faces and laughing, proving that the Victorians had a sense of humour. After all, they had a great deal to do with our modern Christmas celbrations. I am old enough to have met several Victorians. I knew my grandmother Minnie and her unmarried sisters, Winnie and Annie, as tiny, polite ladies who loved to drink tea in their parlour and gossip. They lived at a time when the world was changing due to the industrial revolution. They ran a post office and taught in schools. What was the original idea for An Independent Woman? The story grew out of research, when I discovered a train accident in Sonning Cutting early on Christmas Eve in 1842. I already had my heroine and her back story, and the crash was the perfect catalyst to throw her into a new and interesting world. Philomena is a spirited and resourceful heroine, very appealing to the modern reader, but she exists within a 19th Century context. Did you ever have to hold her back from being too determined so that she remained true to the Victorian setting? Philomena was a child of the early Victorian era and she lived within the customs of the times. That included the complex class system, where a governess existed somewhere between the family and the other servants. Woman were expected to behave demurely and opportunities for a woman to make a living for herself were tightly restricted. However, Victorians were people, just like us, with hopes, dreams and desires. Philomena was always going to make her own way in the world. I think one of her most important characteristics is her ability to come up against a barrier and, rather than give up, find another way roud it. She can think the unthinkable. People with that kind of spark have existed throughout history. I have had to cross out several questions because of not wanting to give away plot points - a definite no-no when discusing a mystery! But anyone who has read the book will understand when I say I was taken aback by what happened to Philomena when she was a child. Were there particular aspects of Victorian life you felt you just had to use? I think attitudes to children have changed enormously since then. Babies and children often died either at birth or due to illness, and both children and women were owned by men. The English legal system in the 19th Century was different in many respects from the current day and there were outcomes of trials that seem shocking today. I recently discovered a case where a Victorian child died of starvation. the mother, accused of murder, was acquitted because she was not married to the (absent) father, so in law the child was not her responsibility. The Old Bailey Online is a wonderful resource, full of transcripts going back hundreds of years. You work as a Speech and Language Therapist and you also advise of good communication techniques, so you must be very aware of different behaviours. Does this help you to "show, not tell," as writers are always being advised to do? I find the way people communicate fascinating. We give so much away in our body language, facial expression and tone of voice, as well as in the words we choose. I like to use conversation to move on the plot, and also to indicate that someone's words may be diffreent to their true feelings. How long did it take you to write An Independent Woman? Are you a disciplined writer? I write in spurts. Once I get going, I find it hard to come up for air. I love the feeling of deep concentration when the world disappears, but the downside is that I hate to have to stop! I find it hard to write small amounts regularly, even though I know that's the best way to keep going. I stopped many times when I was writing An Independent Woman, but always came back to the story. As a result, the whole book took a couple of years! Did you use an editoirial or advisory service? When I submitted to the Wild Rose Press I was lucky enough to have an editor, Cindy Davis, who gave me wonderful advice that took the work to publication. As she American, she keeps me on my toes by asking questions like, "How could there be tangerines in England in the winter?" Tell us about your pblishing choices and decisions. How did you come to team up with Wild Rose Press? I spent a lot of time on the Internet and discovered that writers love working with The Wild Rose Press, so i submitted to them. Needless to say, I also submitted to other publishers and agents. TWRP were the first to offer me a contract and they truly are a great, supportive company. The cover illustration, which is the work of Debbie Taylor, is simply beautiful. Did you have any say in the design? I just love the cover and have it on my wall! I gave a few ideas to Debbie and asked her to produce something that emphasised atmosphere - she understood so beautifully that the gorgeous artwork took my breath away. What's next? Another Thatcham Hall mystery? The next Thatcham Hall mystery, the second of three, is written and I hope it will be available in Summer 2015. Have you any advice for writers? What would you hae done differently if you'd known then what you know now? I sometimes wish I had tried harder to write and find a publisher when I was younger instead of waiting until my children were grown and I had more time. I have been lucky in always having supprt from my family even when I thought I would never have a novel published and wondered if I was simply wasting my time. I would advise other writers to keep writing the stories they want to write rather than try to be like other authors. If the story is good, somewhere there is a home for it. Frances, many thanks for taking the time to join me today. I'll look forward to reading the next Thatcham Hall mystery. Thank you, Wendy. It's a bit of a roller-coaster sometimes - in a good way! I hope you like the book when you get to it - I find there are so many books to read and so little time! Lovely interview Susanna. I identify with the way you write, Frances - careful planning at the start but then that exhilarating experience when the characters play out in front of your eyes and things pop into your head that you can't imagine you'd have ever come up with at plotting level! I love it! The Independent Woman sounds like an intriguing novel, I've added it to my TBR list! Thank you for leaving a comment, Jen. I'm delighted that you enjoyed the interview. I agree with you about liking Frances's advice to writers. It is essential to develop your own voice as a writer. Wild Rose Press authors do seem to be a happy bunch, don't they? I, too, have heard very good reports. Many thanks, as always, Jen, for your continued support of my blog. It is much appreciated. Thank you for reading and commenting, Jen, I'm so glad you enjoyed the interview. Susanna, thank you for hosting me, and for asking questions that made me think! I'm so pleased you enjoyed the interview, Nicola. An Independent Woman is a wonderful book and was lovely to have the opportunity to explore some of its background. Frances was most generous about answering all my questions in such detail. I was fasconated by the anecdote about the mother of the child who died of starvation and I agree with you and Frances that, as writers, we learn from everything we read. Many thanks for your continued support of my blog. Best wishes for your own writing success. Fascinating interview. Thank you both. And wise advice, Frances, to authors 'to keep writing the stories they want to write.' Also nice to hear from another happy Wild Rose Press author. I've heard so many positive things about that publisher. Thanks for your kind comment, Nicola. It's lovely to meet other people who enjoy similar books. I'm always looking out for books that fit well with our tastes! A wonderful interview, Susanna. It's lovely to know I share a similar reading taste as Frances and I agree with her that as a writer there is much to be learned from every book read - whether it is positive or negative. I really enjoyed this post. Thank you.